As I mentioned in an update to my previous blog post, the Rand Hall Fine Arts Library project at Cornell is still under plan review and a building permit has not yet been issued. [Updated Feb. 7, 2018. But you would never know that a building permit has not been issued from this headline in the online AAP News from Jan. 25, 2018: “Construction Begins on Mui Ho Fine Arts Library.” In fact, only demolition and site preparation permits have been issued; the application for an actual building permit is still under plan review by the City of Ithaca Building Division.] One of the points of contention is the status of the unenclosed exit access stairway (Stair “B”) in the atrium that I discussed in detail in that same previous blog post. I have just learned that a third Code section is being considered in relation to Stair “B,” the idea being that an unenclosed exit access stair terminating above the level of exit discharge can actually be designated as an enclosed “interior exit stair”—even though it is not actually enclosed. This latest argument is based on Section 1023.2 (Exception #2) in the 2015 Building Code of NYS, which states that the requirement that “Enclosures for interior exit access stairways and ramps shall be constructed as fire barriers… or horizontal assemblies…, or both…” (with fire-resistive ratings of 1 or 2 hours) need not be applied within atriums. There are at two reasons that this latest attempt to salvage an unsafe and noncompliant design should be rejected. First, the definition of “interior exit stairway” in Chapter 2 of the 2015 Building Code of NYS states that such a stair “provides for a protected path of egress travel.” This means it must be enclosed. That it must be enclosed is reiterated in Section 1023.1 which states unambiguously that an “Interior exit stairways shall be enclosed and lead directly to the exterior of the building or shall be extended to the exterior of the building with an exit passageway.” Neither of these two Code passages are affected by Exception 2 in Section 1023.2. That exception only affects the required level of protection, and does not state that such stairs can be unenclosed. In other words, an enclosure for an interior exit stair in an atrium need not be constructed as a fire barrier with a 1- or 2-hour fire-resistance rating, but, per Section 1023.1 (which isn’t affected by this exception), it still needs to be enclosed. This enclosure is particularly important for smoke control in the atrium space, even without a fire-resistance rating. So, we’re left with Sections 1006.3 and 1019.3 (see previous blog post), and I’ve already commented on the likely outcome based on the consideration of those two remaining code sections. See this web page for links to, and summaries of, all my writings on the Fine Arts Library proposal. This entry was posted in Architecture, Milstein-Rand-Sibley Hall on February 1, 2018 by jonochshorn. The open exit access stairway serving the various library stack levels and roof pavilion (Stair “B” per add-alt. #6, as shown schematically in Figure 1) violates Section 1006.3 of the 2015 New York State Building Code. This code section, which appears for the first time in the 2015 IBC, requires that the “path of egress travel to an exit shall not pass through more than one adjacent story.” Since exit access stairway “B” passes through more than one story before finding an enclosed exit on the second floor, it is in violation of this section. The 2015 IBC “Commentary” confirms this interpretation. Fig. 1. An early architect’s rendering of proposed exit access stairway “B” in Rand Hall showing that an occupant on the 5th floor (roof pavilion) must pass through two adjacent stories (i.e., the 4th and 3rd floors) in order to find an enclosed exit on the 2nd floor (image crudely edited to replace the extension of this exit access stairway to the “lantern” level, which no longer exists, with a schematic representation of the open bulkhead leading to the roof pavilion at the 5th floor). 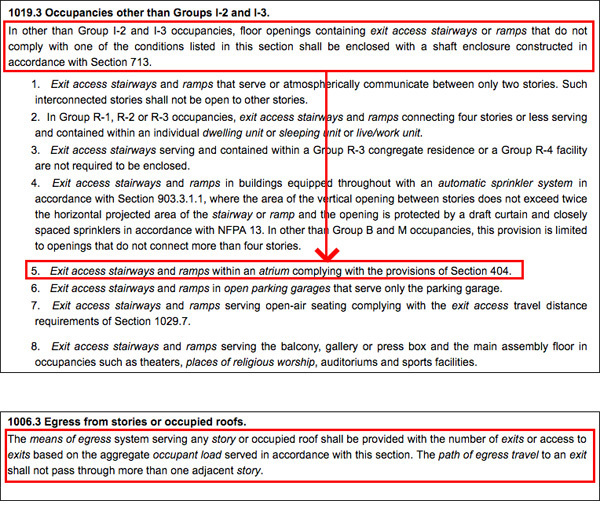 Cornell’s code consultant, in Exhibit A of Cornell’s 2016 Variance request, stated incorrectly that such an open exit access stair is allowed by Sections 1019.3, exception 5, and 404.9.3 in the 2015 NYS Building Code because “Chapter 4 continues to contain provisions which supersedes [sic] other provisions in the Code.” Nothing could be further from the truth. The first section that he cites (1019.3, exception 5) requires that exit access stairways be enclosed if they are not in an atrium. It does not say that exit access stairways in atriums can pass through an unlimited number of stories. The second section that he cites (404.9.3) limits exit access travel distance in an atrium to 200 feet, and is not relevant to the question at hand. On the other hand, Section 1006.3, which Cornell’s Code consultant doesn’t mention in his analysis and which he seems to be unaware of, prohibits such stairs when they “pass through more than one adjacent story.” These code requirements are documented in Figure 2. According to my conversation with Technical Code Experts at the International Code Council (the organization that creates the International Building Code from which New York State Codes derive), this latter Section 1006.3 is specific, clear, and unambiguous, and places limits on the application of Section 1019.3. Section 1019.3 (which says that exit access stairs must be enclosed if they don’t meet various conditions enumerated in that section) is not in conflict with Section 1006.3 (which says that exit access stairs cannot pass through more than one story before finding an exit). The limit placed on the number of stories that an exit access stair can pass through in Section 1006.3 is perfectly consistent with the allowance for an unenclosed exit access stair in an atrium per Section 1019.3. In other words, Section 1006.3 does not prevent exit access stairways from being unenclosed in atriums, but simply places a limit on the number of adjacent stories that such a stairway can pass through. Fig. 2. IBC Section 1019.3 (top) allows unenclosed exit access stairways in atriums; but IBC Section 1006.3 (bottom) limits the number of adjacent stories that such a stair can pass through. It is not unusual to find two sections in the building code where one section establishes limits not found in the other. For example, Section 506 (specifically Table 506.2) allows non-sprinklered (NS) Type IA, IB, IIA, and IIIA Group A-3 occupancies such as libraries to have floor areas in excess of 12,000 sq.ft. 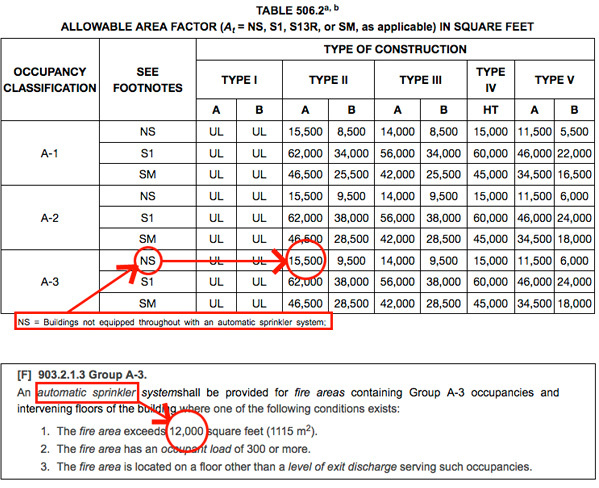 However, Section 903.2.1.3 requires all Group A-3 occupancies with fire areas exceeding 12,000 sq.ft. to have sprinklers. So, in this hypothetical example, if you wanted to place a non-sprinklered, Type IIA library in a building with a floor area of 15,000 sq.ft., and only looked at the allowable area factors in Table 506.2, you might (mistakenly) conclude that it was code-compliant because Table 506.2 says nothing about fire area limits. It is only by checking Section 903.2.1.3 that you would realize that this building floor, defined as a fire area, would either need to be sprinklered or subdivided into fire areas no greater than 12,000 sq.ft. This latter section is not in conflict with the former section, but merely places limits on its applicability. 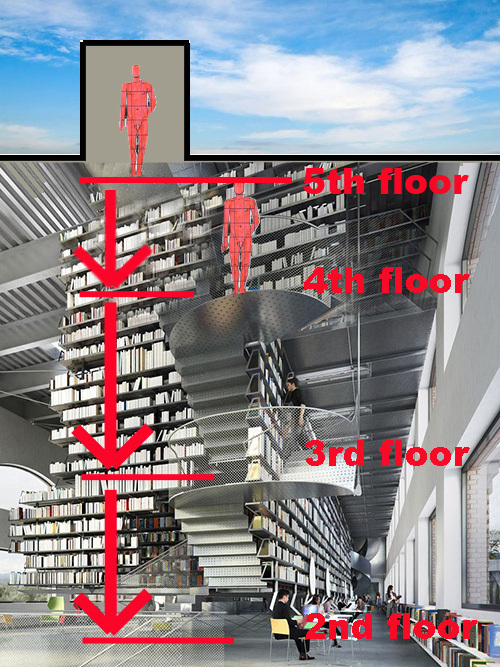 The Group A-3 library would need to comply with both sections, and designers (or code consultants) cannot simply ignore one of the sections because they would prefer not to acknowledge the limits it imposes. Code requirements relevant to this hypothetical example are documented in Figure 3. Figure 3. IBC Table 506.2 (top) limits the allowable area for non-sprinklered Type IIA libraries (Group A-3) to 15,500 sq.ft; but IBC Section 903.2.1.3 (bottom) limits Group A-3 fire areas to 12,000 sq.ft. Taken together, Section 903.2.1.3 places a limit on the application of Table 506.2, but does not contradict it. The two code sections concerning exit access stairways work in exactly the same way as do the two code sections cited in the hypothetical example just given. In the current case, the first code section allows unenclosed exit access stairways in atriums, but says nothing about limitations that may be imposed because of the number of stories that the stairway passes through. Those limitations appear in the second section, 1006.3. Taken together, the two sections 1) allow unenclosed exit access stairways in atriums, and 2) limit the number of stories that such exit access stairways can pass through to a maximum of one adjacent story. So there is no conflict. But even if a conflict is alleged between the two exit access sections cited above (i.e., 1006.3 and 1019.3), the building code has a remedy, and the outcome is still the same. Section 102.1 of the 2015 IBC states: “Where there is a conflict between a general requirement and a specific requirement, the specific requirement shall be applicable. Where, in any specific case, different sections of this code specify different materials, methods of construction or other requirements, the most restrictive shall govern.” Section 1019.3 does not specifically permit exit access stairways in atriums to pass through unlimited numbers of stories. It just says that if such a stair is not in an atrium (or any of the other seven conditions listed), then it must be enclosed in a shaft enclosure. It is mute on the question of whether exit access stairways in atriums can pass through more than one adjacent story; whereas Section 1006.3 specifically prohibits such a stair from passing through more than one adjacent story. The open stairs are therefore unambiguously noncompliant under the 2015 NY State Building Code because they pass through more than one adjacent story before finding an exit. 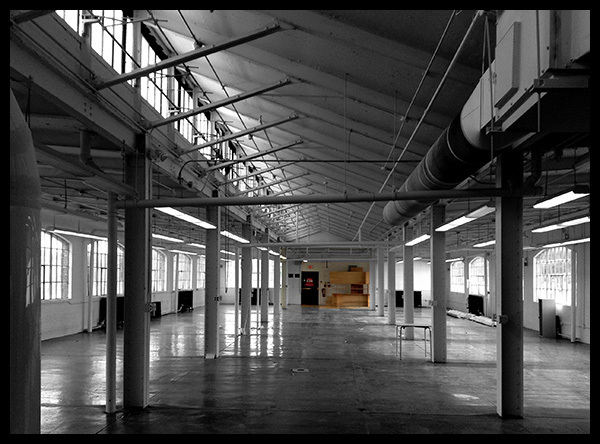 Under Add-Alternate #6, the atrium space needs to be separated from the occupied roof pavilion and occupied roof deck with 1-hour fire-resistance rated horizontal assemblies and fire barriers. In addition, all structural steel supporting the roof deck, including the deck itself, roof girders, and all steel columns supporting the girders, need to have a one-hour fire-resistive rating. I noticed that these structural elements in the atrium were specifically excluded from having any fire-resistance rating on working drawing number G-003, and I’m not sure if Add-Alt #6 included provision for this additional fire-proofing. It is required if the roof above the atrium is occupied, per IBC Sec. 404.6 and Sec. 711.2.3. Exit access stairway “B” is within the atrium and extends up to the bulkhead (pavilion) on the roof in Add-Alt #6. It does not seem consistent with atrium smoke control requirements. Not only is it at the highest point in the atrium, where hot smoke naturally migrates, but it also contains an exit door which, when opened along with the exit door from the pavilion area itself, would draw hot smoke from a fire through the exit door at roof level, precisely in the path of occupants attempting to exit through that stairway. Section 8 on Drawing Number 109 (Add-alt #6) does not clearly show a roof over the interior exit stairway, and also shows what looks like a brick obstruction drawn halfway across the door leading to the 4th-floor walkway to the stacks. It is hard to see how there would be sufficient headroom in the portion of interior exit stairway “A” leading from the enclosed part at the 4th floor level to the exterior pit where Stair “A” continues up to the occupied roof. I can’t find any drawings which provide definitive details, but unless the roof over Stair “A” is raised considerably higher, there appears to be a major headroom problem. See this web page for links to all my writings and blog posts on the Rand Hall library proposal. This entry was posted in Architecture, Milstein-Rand-Sibley Hall on January 22, 2018 by jonochshorn. This entry was posted in Architecture, Milstein-Rand-Sibley Hall on December 17, 2017 by jonochshorn. On May 22, 2017, updating an earlier blog post (Egress, toilets, and carcinogens: Cornell’s transition plans during Fine Arts Library construction), I wrote that “transferring outside air from a corridor into the digital fabrication lab would not be compliant with the 2015 Mechanical Code. However, since the corridor seems to be now labeled as a room (‘collaborative area’), it’s probably legal, but barely. 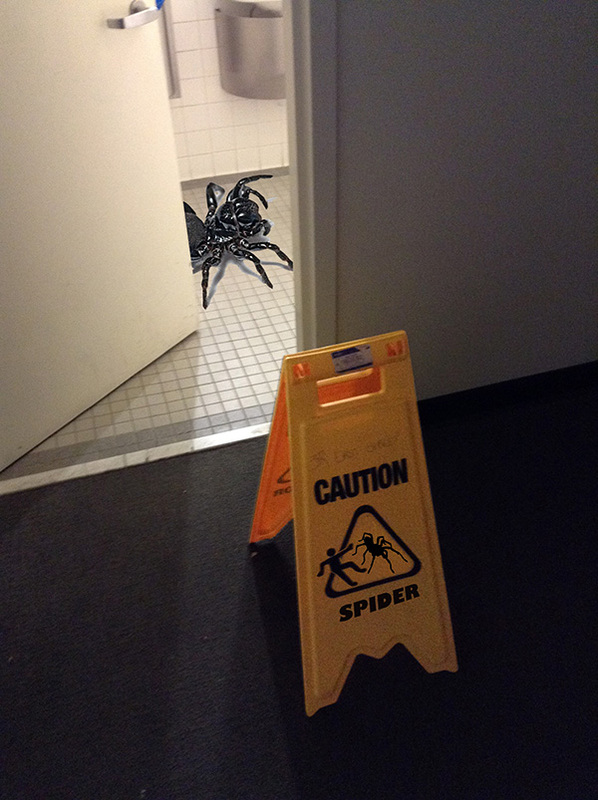 The opportunistic and ad hoc manner in which such design decisions are, and have been made, does not inspire confidence.” It is now apparent that the actual use of this new “room”/corridor has confirmed my fears: the ability of this “collaborative area” to function properly as part of an egress path has been seriously undermined by the types of activities assigned to the space. This entry was posted in Architecture, Milstein-Rand-Sibley Hall on December 3, 2017 by jonochshorn. I’ve written about the impending bathroom crisis for the Department of Architecture at Cornell here and here, caused by the renovation of Rand Hall. When this renovation begins, there will only be a single men’s toilet available for the entire 32,000 square foot floor area comprising the second floor studio and office spaces in Milstein and E. Sibley Hall. 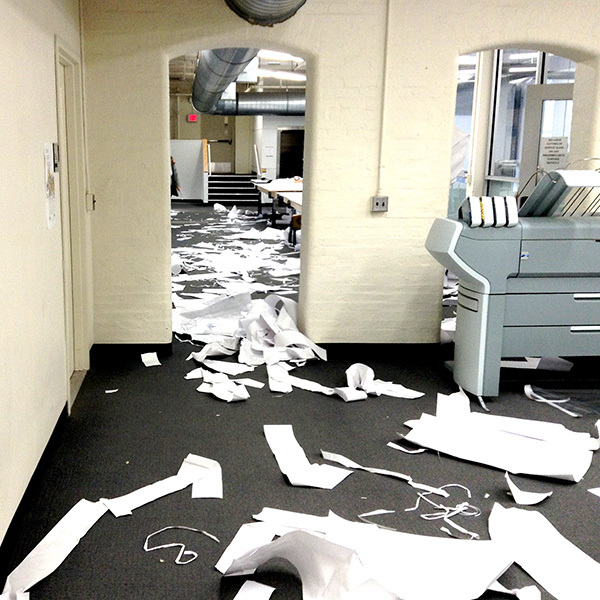 As hordes of desperate students and faculty from the second floor trek up to the “private” third floor Frances Shloss studios, it is inevitable that faculty and students on the third floor will take retaliatory action. As they say, the writing is on the wall. This entry was posted in Architecture, Milstein-Rand-Sibley Hall on October 20, 2017 by jonochshorn. I’m not an Instagram fan, so I end up posting my favorite images here. I took this one in Sibley Hall a few days ago. Sibley Hall is part of the College of Architecture, Art, and Planning at Cornell. 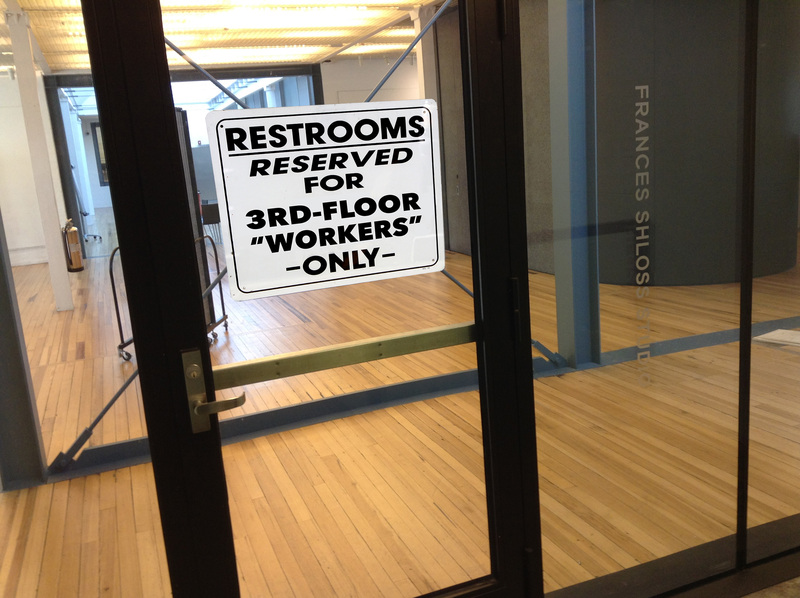 When neighboring Rand Hall is closed down for renovation in a few months, this single toilet will be the only viable option for men, not only those in offices and facilities on the second floor of Sibley Hall, but for students and faculty using the 25,000 square feet of studio space in adjacent Milstein Hall. When asked about this at a recent faculty meeting, the Dean of the College stated that the “solution” to this problem will most likely be a request for a Code variance. This entry was posted in Architecture, Milstein-Rand-Sibley Hall on October 13, 2017 by jonochshorn. Every time I see a sign for something good—for example, a sign at the supermarket that says something like “healthy choices”—I wonder where the missing sign for “unhealthy choices” has been hidden. Well, thanks to the power of Photoshop, I can rectify that situation. I recently passed a new sign pointing to the new building addition and renovation for “Cornell Health”; I’ve added in the “missing” sign pointing to Architecture. 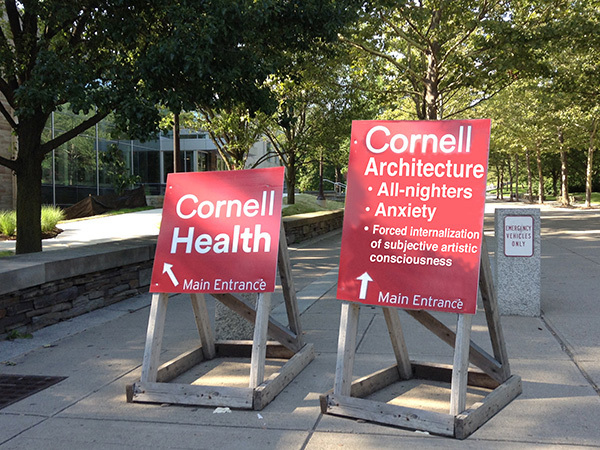 A new sign points to Cornell’s just-completed “Health” building addition and renovation. I’ve added the complementary sign for Architecture. This entry was posted in Architecture on August 1, 2017 by jonochshorn. I was interrupted today by two workers who needed access to Milstein Hall in order to inspect roof leaks; the green roof itself has been in a state of partial demolition for the last two years, as I described in this blog post from May 2017. 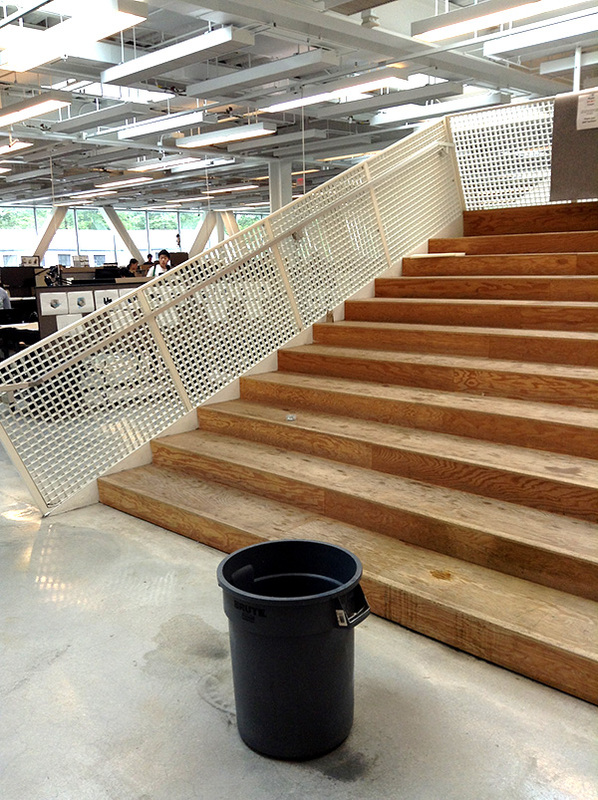 There are several areas where water is currently coming down, mainly in the stepped seating area and over the wooden floor area. This entry was posted in Architecture, Milstein-Rand-Sibley Hall on July 25, 2017 by jonochshorn. When Frank Gehry built an addition to his traditional house in Santa Monica, California in the 1970s, at least some of “Gehry’s neighbors were not happy at the unusual building being built in their neighborhood,” according to Wikipedia. 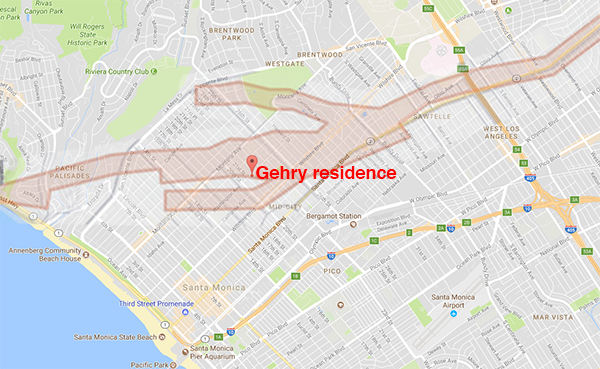 Well, it turns out that not only Gehry, but the whole upscale neighborhood, is sitting on an earthquake fault that could do more damage to their homes than any mere symbol of deconstruction. This entry was posted in Architecture on July 17, 2017 by jonochshorn. It’s both a bit weird, but also quite expected, to see the same design tropes appearing over and over again within the same time period at the same place. I hinted at this phenomenon in my 2009 song, Prisoner of Art. 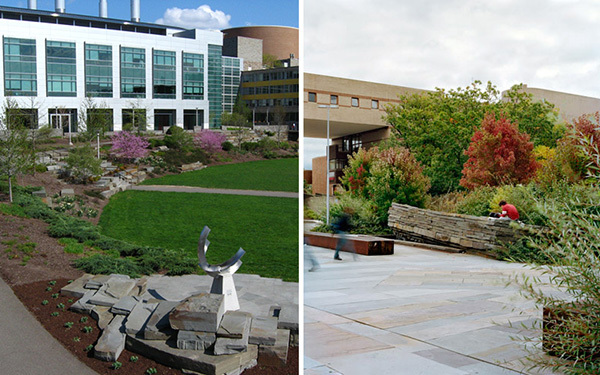 Two examples from the Cornell campus follow. The first is based on the idea that, because Cornell is situated between two gorges, the idea of the gorge should somehow be expressed in new campus construction. So not only do we get the West Campus dorms designed by Kieran Timberlake referencing the glacial topography of the Finger Lakes, but also more literal representations of the gorges in Bailey Plaza (Michael Van Valkenburgh Associates: “A tilted, striated bluestone fountain presents a mysterious dark pool at its base, making material reference to Ithaca’s famous gorges”) and the Pew Engineering Quad (EDAW, Inc.: “The created landscape will dramatize the topography by adding landscaped slopes that recall the natural character of the nearby Cascadilla Gorge”). Second, the idea of defamiliarizing the standard turf quadrangle by “tilting” up one corner of a parterre has shown up in at least three recent landscape gestures at Cornell: at the Law School’s new underground addition (Ann Beha Architects with Trowbridge Wolf Michaels Landscape Architects); at the entry plaza in front of Weill Hall (Richard Meier with Olin Landscape Partnership), and in the triangular space bordered by Milstein and Rand Halls (OMA Architects with Scape Landscape Architecture). This entry was posted in Architecture on July 10, 2017 by jonochshorn.